Growing up in Bremen, Germany, Carl von Hassler always knew he wanted to be an artist. But parents often have different ideas, and at age 14, Carl found himself enrolled in the German Naval Academy. Fortunately, the Academy offered elective art courses and the aspiring young artist was delighted to realize that he could obey his father’s wishes and learn to draw and paint at the same time. Von Hassler experienced another life-altering event two years later when he attended a performance of Buffalo Bill’s Wild West Show. His father, a prominent businessman, had helped bring the temporarily bankrupt troupe to Bremen. “That’s when I first decided to go to America,” he recalled. That opportunity to go abroad finally arrived in 1912 after he finished his naval service and also completed six years at the Düsseldorf Art Academy. Von Hassler first settled in New York where he studied with members of the Ashcan Group. 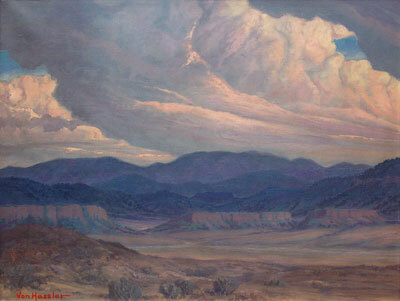 By 1917, as America prepared to enter World War I, several of the Ashcan painters were drawn to New Mexico, lured by the beauty of its landscape. Ironically, von Hassler heard a very different call. So great was his dedication to his new home he joined the U. S. Army in the fight against his homeland. In Germany, von Hassler’s brother also signed up to fight, literally pitting the family against itelf. When his brother was killed in the war, von Hassler’s mother disinherited him, and he decided never to return to Germany. 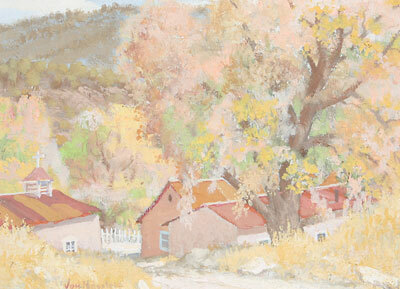 After four years of service he was released from the US Army and, in 1922, von Hassler moved to New Mexico. Instead of following his New York acquaintances to Santa Fe, however, he settled in the up-and-coming town of Albuquerque. 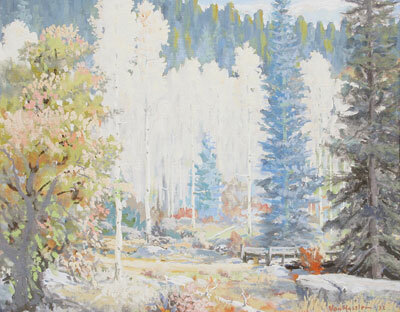 Von Hassler’s enthusiasm for the Southwest and his fascination with his new surroundings fueled and renewed his artistic career. Ever the scholar, he threw himself into the exploration of the indigenous plants and animals, as well as the people, of New Mexico. In his early years in the state, von Hassler made careful study of Navajo culture, spending many days at the trading post in Manuelito, talking with residents of the area and sketching their likenesses. He took up this self-appointed task with such dedication that he eventually became proficient in the Navajo language. 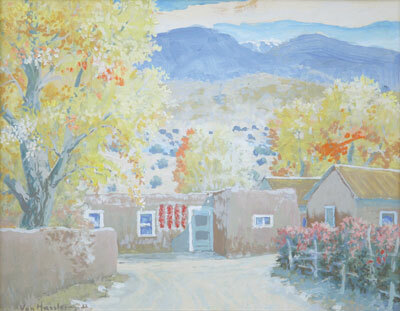 The Indian Pueblos of New Mexico were another favorite subject for von Hassler, and he systematically sketched and painted each of the villages. In 1927, he used these studies as the basis for his first important commission: murals for the Pueblo/Deco style KiMo theater in Albuquerque. The ten-panel painting depicts the legendary Seven Cities of Cibola which the Conquistadores thought were “cities of gold” but turned out to be native farming villages. The murals were restored in 1989 and still adorn the historic theater. 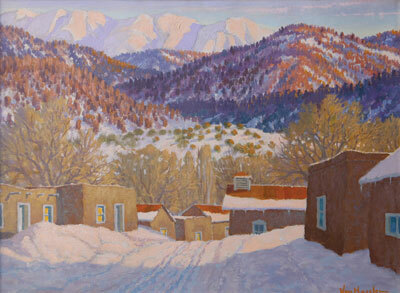 As von Hassler’s career in New Mexico advanced, he concentrated more and more on painting the landscape he had come to love. 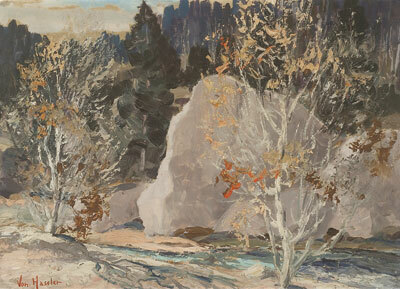 By the 1930s he was widely known for his ability to capture the moods of the land as it changed through the seasons. He did this with a carefully controlled palette consisting of a limited range of finely modulated color. However, this technique was actually based in his knowledge of the natural world. His friends and students recalled that von Hassler was an expert on nature lore and could name almost any plant that grew in the state. 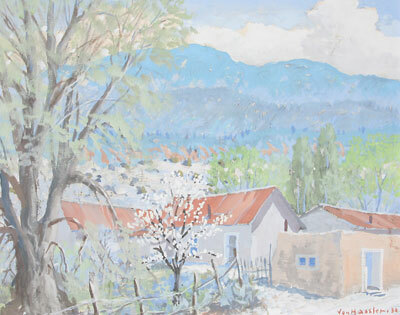 In a 1961 newspaper interview, von Hassler talked about the importance of thoroughly knowing the landscape before an artist can paint it effectively. Not only did von Hassler study and enjoy his subjects, but he also enjoyed the very act of painting and reveled in the feel of various media. 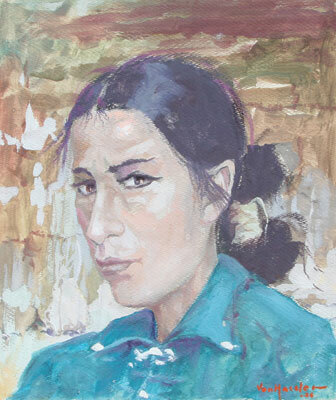 He was equally skilled with different kinds of paint, his favorites being oil, egg tempera, and watercolor. At the Academy in Düsseldorf he had studied the chemistry of paint, and throughout his career was known for experimenting with new materials to achieve exactly the colors and textures he wanted. Von Hassler once told a reporter that he had developed a technique for baking paint at up to 600 degrees so that it would take on a ceramic-like appearance and would be permanently colorfast. Since it was not possible to subject canvas to high temperatures, he also created what he called an “atomic substance” for use as the ground on which to paint. He was better known, however, for developing an “acid tempera” paint which bonded with a paper ground. Unfortunately, von Hassler was reluctant to divulge his various formulae, and now very little is known about the paint media he invented. He seldom showed his work in galleries as he was able to sell most of his paintings privately. He took pride in the fact that they found homes in many countries around the world. Von Hassler also completed major commissions for such notable Albuquerque buildings as the 1939 Albuquerque Airport, Fred Harvey’s Alvorado Hotel, the Franciscan Hotel, Bank of New Mexico, and First National Bank. Sadly, his ceiling decoration at the Airport is the only of these commissions that have not been removed or destroyed. When Carl von Hassler died in 1969, his students fondly remembered him as a stern and demanding teacher, but one who got results. “…he was a disciplinarian as a teacher and an artist.” “Most important, he demanded patience and self-discipline in our work,” two students recalled. But this was no less than he demanded of himself, always reinforcing his art with his constant search for knowledge. Canyon Road Arts wishes to thank Patti Gonzales of the Albuquerque Museum for her assistance with this article. This article was excerpted from Canyon Road Arts: The Complete Visitors Guide to Arts, Dining and Santa Fe Lifestyle, Vol 3, 2007-2008, pages 50-54. Canyon Road Arts is published by Medicine Man Gallery. All rights reserved.